With an excess number of bodies comes competition, something the Winnipeg Jets have plenty of. This feistiness was evident when earlier this week captain Blake Wheeler and depth defender Ben Chiarot were involved in an altercation at practice that included punches thrown from both sides. When practice finished and the media piled into the dressing room, the overwhelming sentiment from players was “boys will be boys.” The Jets followed up the plucky practice by punching their ticket to the Stanley Cup Playoffs with an extremely impressive win over the West’s best, the Nashville Predators. 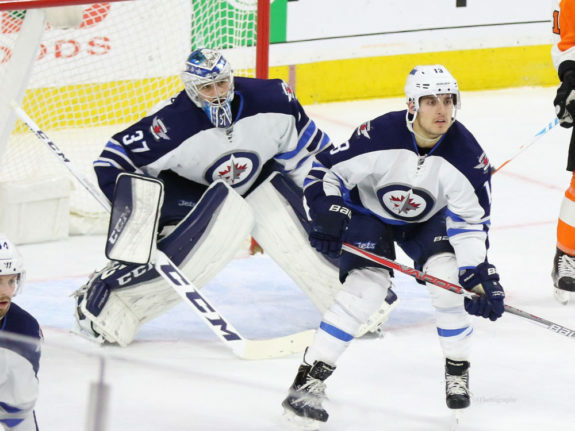 The next game would not be much easier as the Eastern Conference powerhouse Boston Bruins came to town with an opportunity to spoil the finale of a six-game homestand that saw the Jets win the first five contests. #NHLJets coach Paul Maurice on why Brandon Tanev stays in the lineup over Jack Roslovic: "He can kill penalties and he can be really, really physical and he's very. very fast. There's a lot that Brandon brings. He's a heavy shot-blocker for us." The organizational competition was on display yet again as depth winger Brandon Tanev, who’s been subject to criticism over dressing instead of Jack Roslovic, cemented his place in the lineup for the time being. With a healthy lineup against the Bruins, head coach Paul Maurice decided to play a match-up game. Adam Lowry, Andrew Copp and Tanev shadowed arguably the best line in the league which features Brad Marchand and David Pastrnak centered by four-time Selke Trophy winner, Patrice Bergeron. It was apparent this was a smart decision almost instantaneously as Tanev buried a greasy goal on the side of the net just over five minutes in. 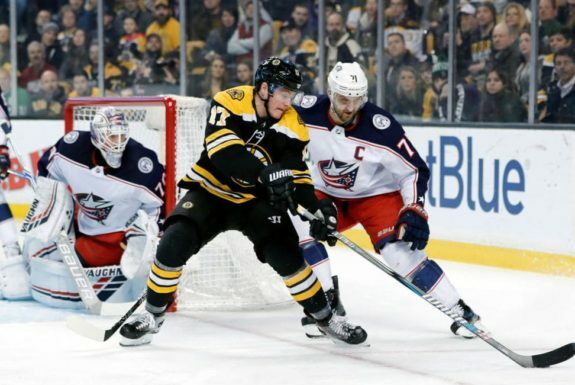 The Bruins’ glut of young talent is one of the biggest reasons for their resurgence this season and their latest addition, Ryan Donato, roofed a backhand over Hellebuyck with under one minute to play in the first period for his third goal in five career games. The late goal could have been a backbreaker for the Jets but Tanev picked up the puck, flew down the wing past all-star Brad Marchand and sniped his second of the night just sixteen seconds into the middle frame to make it 2-1. Underrated deadline acquisition Joe Morrow had his best game in a Jets uniform as he unloaded a temporary insurance marker past Bruins’ netminder Anton Khudobin to make it 3-1. Wheeler picked up an assist to give him 600 career points. The Bruins’ battled back with a pair of goals on a five-minute major to Josh Morrissey for boarding rookie Matt Grzelcyk but then the seemingly impossible happened. Whenever a player is working on a two-goal night, there is a different feeling when they touch the puck. A feeling of anticipation and preparedness for the roof to blow off the building when the crowd erupts. The two biggest reasons Tanev stays in the lineup is his tenacious forecheck and penalty kill, something that he demonstrated in a full-on clinic to score the first hat-trick of his professional career. Torey Krug knotted the game up at 4-4 with a wicked shot from the point which eventually led to a shootout where Patrik Laine scored the deciding goal giving the Jets’ their fourth straight win in extra time. “He scores in practice, he’s not in a role where he’s going to get power-play time and those type of things, but no, when you work that hard, every once in a while, something great is going to happen for you,” said Maurice of Tanev’s effort. The Jets put an emphasis on scouting college hockey which has led to some of their most successful players and prospects including Mason Appleton, Kyle Connor, Copp, Tucker Poolman, Roslovic, C.J. Suess, Jacob Trouba, and goaltender Connor Hellebuyck. While Tanev was not a draft pick of the Jets, they recruited the sought after Providence College product. “We have been consistently impressed by Brandon’s pace of play, his competitive level night in and night out, and his ability to get on the puck,” said general manager Kevin Cheveldayoff when they signed Tanev in 2016. Cheveldayoff pretty much hit the nail on the head with his description of the Toronto native’s game. If Maurice’s utilization of Tanev is not an indication of his trust in the player, his praise off the ice sure is. “He can kill penalties and he can be really, really physical and he’s very, very fast,” said Maurice. “There’s a lot that Brandon brings. Tanev’s older brother, Chris, is the Canucks’ go-to guy on the blue line and the hardnosed defender knows a thing or two about the grind of an NHL season, something Brandon is beginning to get the hang of. In the six-foot winger’s first 54 games, he only contributed four points. Though his physical play maintained a high level, he certainly left fans wanting more. In 56 games since, he has amassed 15 points and continues bruising bodies leading the Jets this season with 169 hits, averaging three per game placing him top-ten league-wide in that category. Tanev embodies that team-first grinder that everyone cheers for. This offensive outburst is not expected moving forward, however, in hockey, confidence is everything.